Over the past couple of years I have attended many 1940s events, where I have taken photographs on my Mamiya C330F. During this time it has dawned on me that there are substantially fewer events dedicated to the First World War. One exception was the Crich Tramway Edwardian Event back in July. That was until I saw that the Apedale Valley Light Railway was holding a WW1 themed event called ‘Tracks to the Trenches‘. I was really excited to be able to go to a World War 1 themed event, and this excellent little museum provided a great backdrop for my re-enactment photography. During the day I used FP4+ film, in combination with the 80mm, 135mm and 180mm lenses on the Mamiya C330F. I would later develop the films in the usual developer of choice, Ilford DD-X. As part of the displays at the Apedale Valley Light Railway a small section of a WW1 trench had been constructed. This included sandbags, tin huts and barbed wire to give an impression of the conditions soldiers had to fight in. 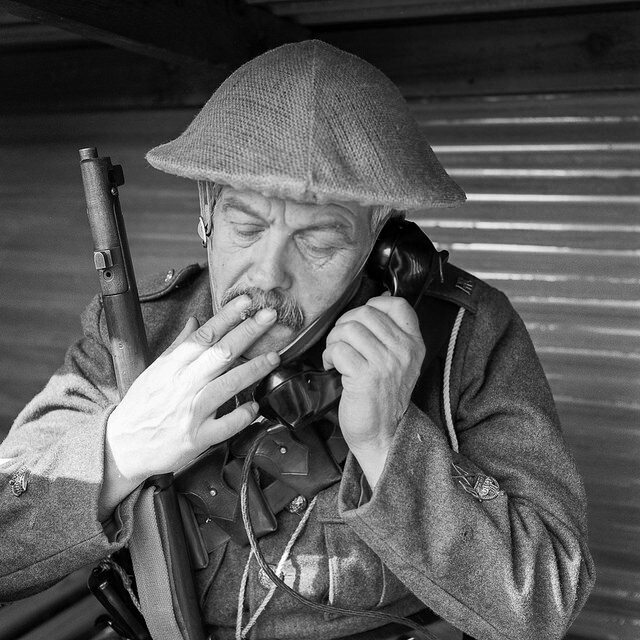 A WW1 re-enactor uses a telephone in one of the tin huts within the trench complex. I liked the disconnection between the subject and the camera, and the smoking of the cigarette as he makes the call. 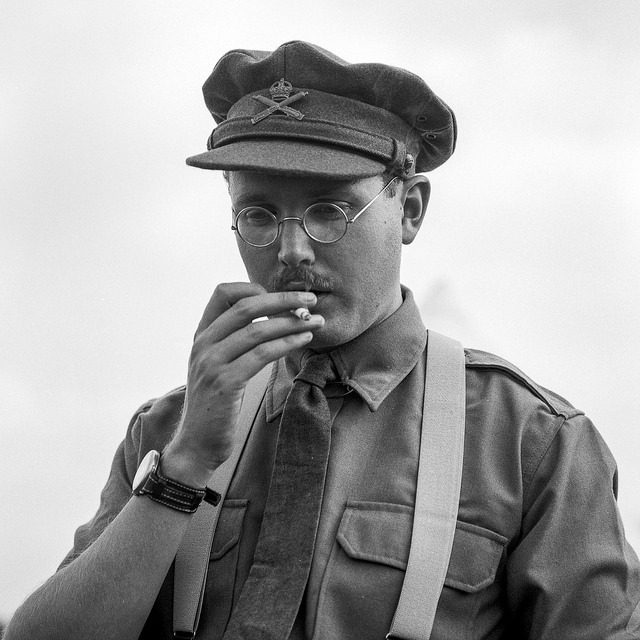 I thought that the casual look of this photograph represented the ‘carry on’ attitude of British soldiers during the First World War – he smokes his cigarette as he uses the telephone, as he would have done at home. I also liked the way that a small amount of light was entering into the dug out, catching the creases and folds in the uniform in the lower right. Another part of the trench display included a step which soldiers would have stood on to see over the edge of the trenches. On this section, I took a photograph of a re-enactor as he readied his rifle for firing. 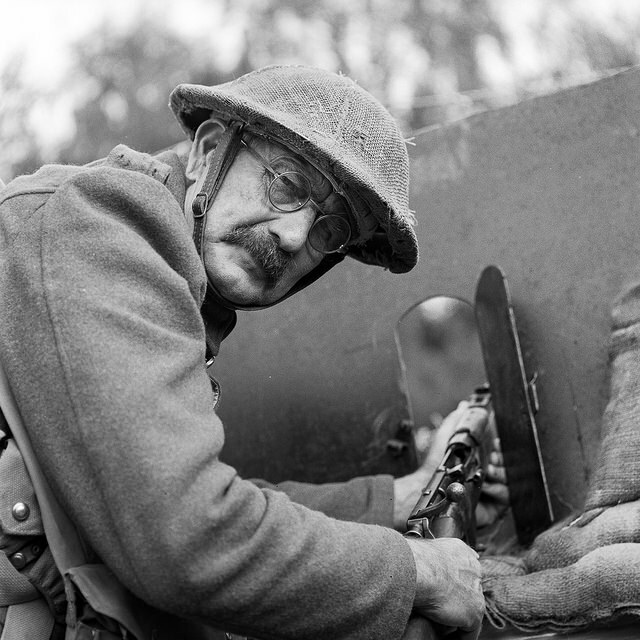 An older gent readies his rifle for firing in the trenches. The look in the subjects eyes allude to harsh realities experienced by soldiers during WW1. This photograph really stood out to me – the look in the subjects eyes suggest almost desperation and defeat, probably in the way real soldiers would have felt at the time. The lens has captured really fine details in the face, and the opening in the trench pulls the eye through the photograph. Out of the trenches there were various troops taking part in exercises on the railway, from being transported on the narrow gauge trains to riders on horseback. One group taking part was the Great War Society who had displays including a lewis gun crew among others. The Lewis gun played an important part in the First World War, and naturally became part of several of my photographs. 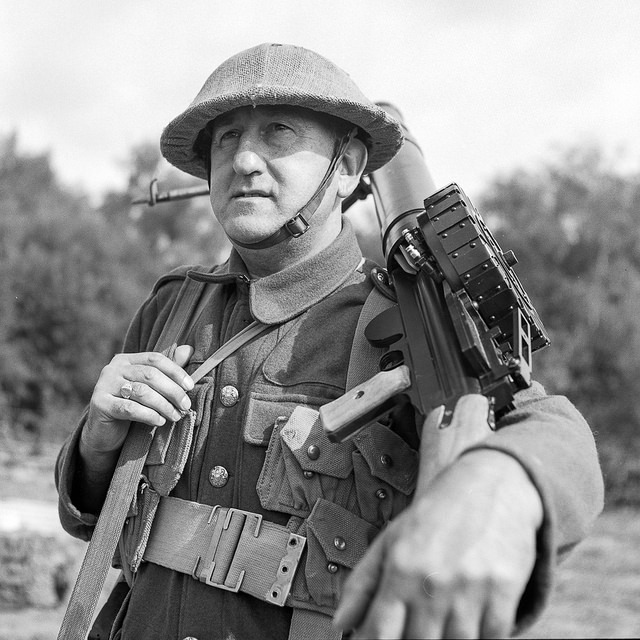 A soldier carries a Lewis gun over his shoulder. I liked the way the arm down to the gun, then into the soldiers face. This person could have been anyone’s relative sent to the front to fight. I thought that this image typified how normal people, from many families across the land were drawn into the war and turned into killing machines. 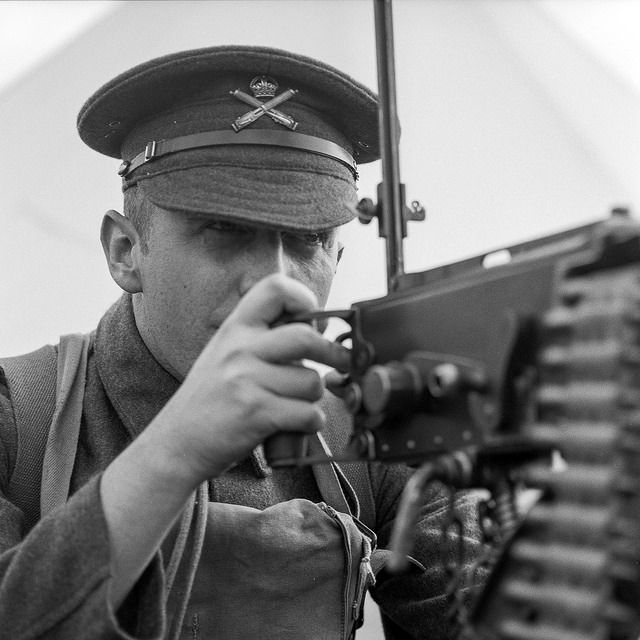 I felt that the depth in this image created by the arm being close to the camera, leading the eye down to the gun and through the back of the photograph highlighted the importance of the machine gun in the fighting in the trenches. Another great casualty of the First World War was celebrated at the Tracks to the Trenches event. The horse was an essential part of life in WW1, yet many of these brave animals became casualties in the mud and shelling of trench warfare. I thought the significance of four horsemen being part of this photograph was very fitting for the apocalyptic environment of the trenches. 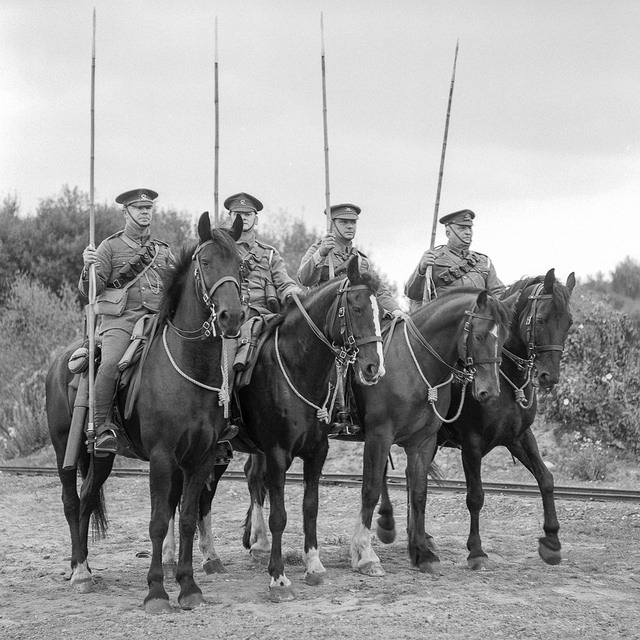 I thought that this simple photograph of the horses with riders was a fitting way to capture the relationship between the soldiers and their animals. I especially liked the way that there is slight movement in the hoof of the horse on the right of the frame, as it scrapes at the dirt. Many of the fighters in the First World War suffered the effects of shell shock from the constant artillery barrages and explosions experienced on the front line, and from the gruesome sights of fellow comrades slaughtered by the shelling. I thought that the following photograph captured an essence of this effect upon troops in the field. An officer smokes a cigarette against a clear white background. I felt that this image, and the disconnection of the subject from both the camera and the background symbolised the isolation many felt from the experience. The lack of any background, and the isolated and lost look in the subject’s eyes created an image with subtle impact. In many of my photographs the background is important to establish a setting and context, but here the lack of any background suggests complete disconnection. 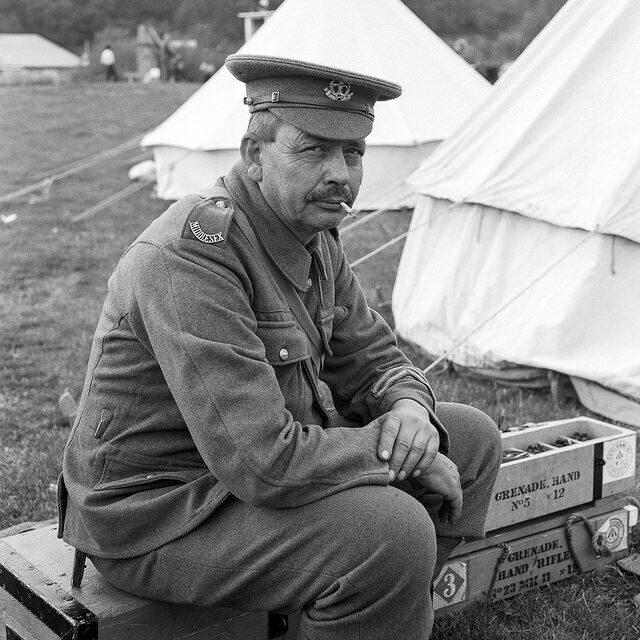 Fatigue and frustration also played a part in troop morale in the First World War. Many people did not agree with war even as a concept, while others thought that poor leadership was sending many people to a certain death on the barbed wire. A troop rests on boxes of ammunition and grenades. I thought that this photograph summed up the exhaustion faced by soldiers on the front. In this photograph the eye contract really focuses the viewer onto the gent. I often find older gentlemen have much more expressive faces when it comes to photographing people at events such as this. Drills are a big part of military discipline, and capturing them in a way which says something about the First World war can be rather difficult. Troops taking part in a drill. I felt that this image, with most of the soldiers turned away from the camera represented the people who would never return from the trenches. I felt that this image represented the many troops who were never found after being killed in the trenches. The depth of field as the image focuses on the far soldier gives a sense of depth to the image. The repeating shapes of the rifles also shows how each of these men was equipped to kill. Later in the afternoon a machine gun crew set up in the trench area. 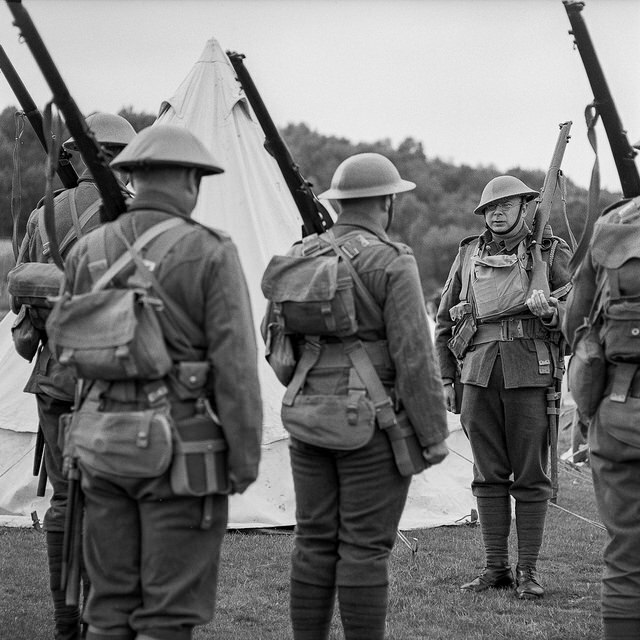 This was a great opportunity to get some photographs of troops preparing to fight. A machine gun crew prepare their gun for action in the trenches. I thought this showed a very matter-of-fact approach to preparing a weapon for killing. To me this image showed both the importance of teamwork that took place between comrades in the trenches, but also the procedural nature of preparing to kill. 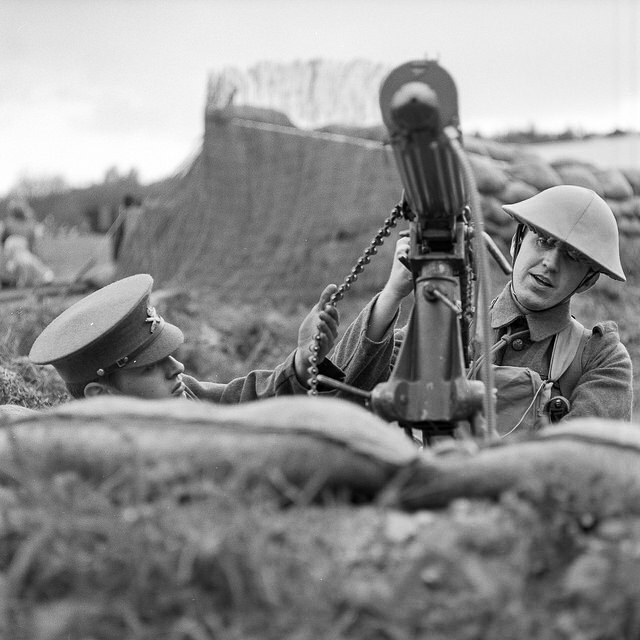 The foreground and background blur helps to focus on the two men preparing the Vickers machine gun for operation. A soldier looks down the sights of a Vickers machine gun. The focus on the eyes creates a powerful photograph as a troop prepares to open fire. This closeup of a soldier looking down the sights showed the focus and concentration required to operate these devastating weapons. The actual weapon itself appears blurred and merely provides a context, where as the soldier’s eyes under the brow of his cap gives an insight into the mentality of the operator. I really enjoyed my time at the Tracks to the Trenches event at the Apedale Valley Light Railway. There were great displays, and plenty of locomotives to see at one of the largest WW1 re-enactment events that I have been aware of. I would like to thank all of the organisors and re-enactors who put in such hard work to make the event such a highly enjoyable day out. You can see a full set of images in my Apedale Valley Light Railway Tracks to the Trenches album on Flickr. If you have any questions to ask, please get in touch.